I mentioned back in November that I had been inspired by a book called How to Raise an Amazing Child the Montessori Way. A friend recommended it when Eva’s room had gotten completely out of control and so we updated the nursery to fit closer to the Montessori style (less stuff, more thought). The nursery redesign worked out so well that I’m actually doing a 2.0 version of it and cutting back even more. It’s funny, because it seems on the surface like it’s mean to box up most of Eva’s stuff and only let her keep a few things out, but it’s obvious that paring down actually allows her to enjoy her things (and her space) more. Definitely a mom lesson in there about what I need to be doing about my own stuff. 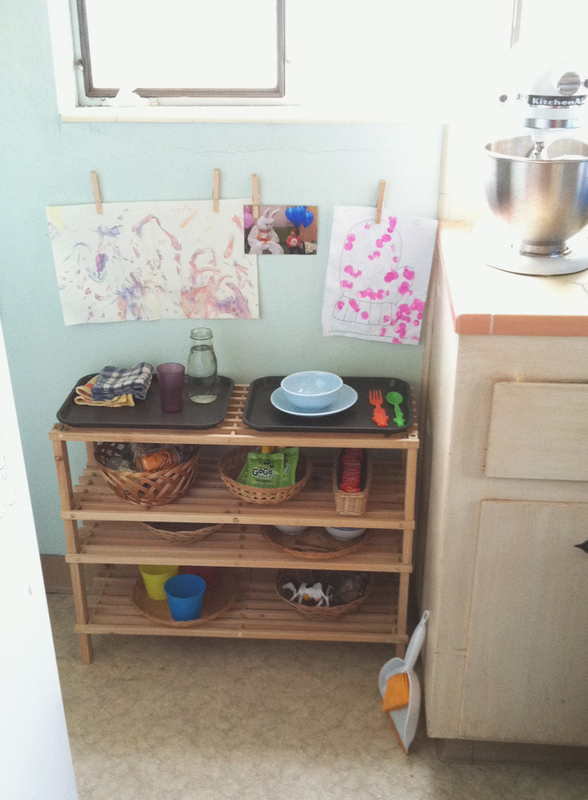 When I redid her room, I also followed the book’s advice on adding a kitchen space for independent food prep. The Montessori method is all about letting kids be self-sufficient and though I can’t totally get on board with all of the ideologies in the book, I really like the advice on bringing your home down to your kid’s level. The book suggested that Eva should have a space in each room of the house where she could participate in appropriate activities on her own level. For the kitchen, it suggests an area where Eva can reach and prepare her own snacks, a pouring station for getting a drink, and perhaps a few “works” (activities) to keep her busy if I’m going to be spending a lot of time in the kitchen. To create her space back in November, I took the glass doors off a metal cabinet that I had spray painted a couple of years back. We’d been using it to hold our wedding dishes, but I was able to make space for them in the hutch and with the doors removed the cabinet was the perfect size for Eva. I added different stations in the cabinet so that she’d have lots of options. The top shelf was designed to offer a variety of dry snacks that could be mixed together in the provided bowls (sort of a trail mix station). We found the small plastic containers at a local Asian market for about a dollar a piece and I filled them with nut-free cereals and dried fruit. Her drink station was on the lower shelf. It contained a pitcher of water, a few different cups to choose from, and a pile of small dishcloths that she could use for spills. 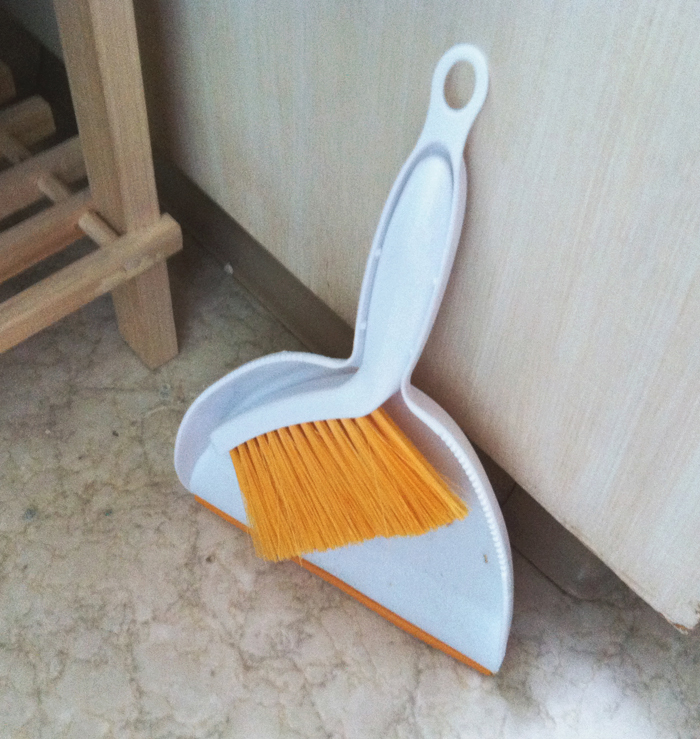 We also picked up a small broom and dustpan in case she had a trail mix spill. The bottom shelf held additional “works” so that she could be occupied while I’m worked in the kitchen. I spend a fair amount of time cooking and baking these days, since there are a bunch of things that have to be homemade in order to be safe for Eva, so I was excited about the prospect of not having to haul a tub of toys in whenever I wanted her to be entertained. The first work was a tray with a bucket of beans, a handful of different metal utensils (purchased at the Asian market) and a small wooden bowl. The work was designed to teach her about scooping and dumping. The next work was a set of salt shakers with different items in them. This is a smell work – designed to teach her about how different things can smell. 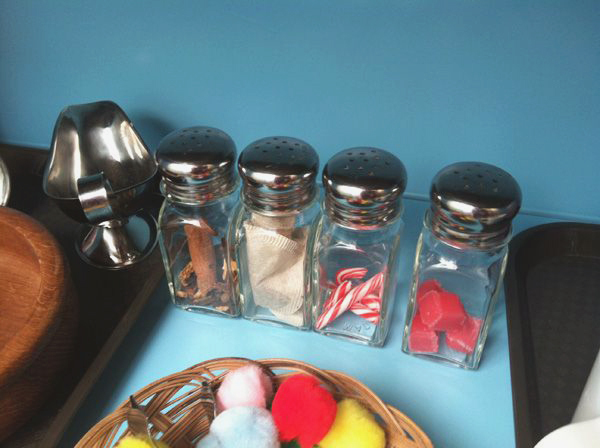 The shakers hold peppermint sticks (enhanced with some mint flavoring), a couple of strong-smelling tea bags, cubes of scented wax, and mulling spices. The last work was a basket of puff balls and a small pair of tweezers, designed to teach her about pinching small objects. When we purchased them, Eva had never used tweezers before so this was a brand new skill. 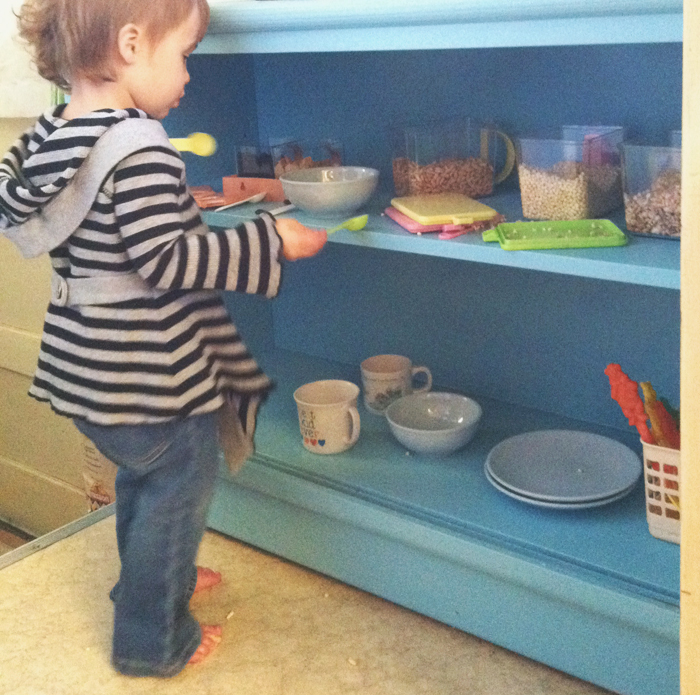 When we introduced Eva to the shelf, she absolutely loved it. She interacted with every station immediately and when she spilled or made a mess, she got a thrill out of using the towels and hand broom. She was also very excited about having 24/7 access to cereal and raisins. Now, just about six months later, it was time to reevaluate the kitchen station. What was working: Eva loved having her own space in the kitchen and went there multiple times a day, even if we were in other rooms. The beans and puff balls were her favorite things and she managed to go through almost all of the utensils daily. What wasn’t working: Lots of things weren’t working. For one, the food and drink stations had been abandoned for a couple of months. Although Eva loved them, she mostly loved making mixes and did not really love eating the mixes. Bowls of trail mix stayed uneaten on the shelves for days until we cleaned them up and usually they contained dried beans and puff balls as well as food. In fact, although Eva was having a ball, the whole thing deteriorated into a hot mess pretty quickly because using the towels and broom was just as fun as playing, so there was no reason for her not to dump a cup full of beans on the floor and top it off with a pitcher full of water (and maybe a handful of cereal sprinkled on top). We cleaned lots of those messes before we abandoned the food/drink and just let her use the space to hold toys. Now that I’m redoing Eva’s room to make it even more like the Montessori book suggests, I knew it was time to take another look at the kitchen. I decided that my first attempt was too advanced, since it might have been perfect for a slightly older child but my kid is still in the dump and scatter phase. The cabinet I had used was also problematic, because the deep shelves made it hard to clean food messes and even on a good day there was lots of stuff crowded together. 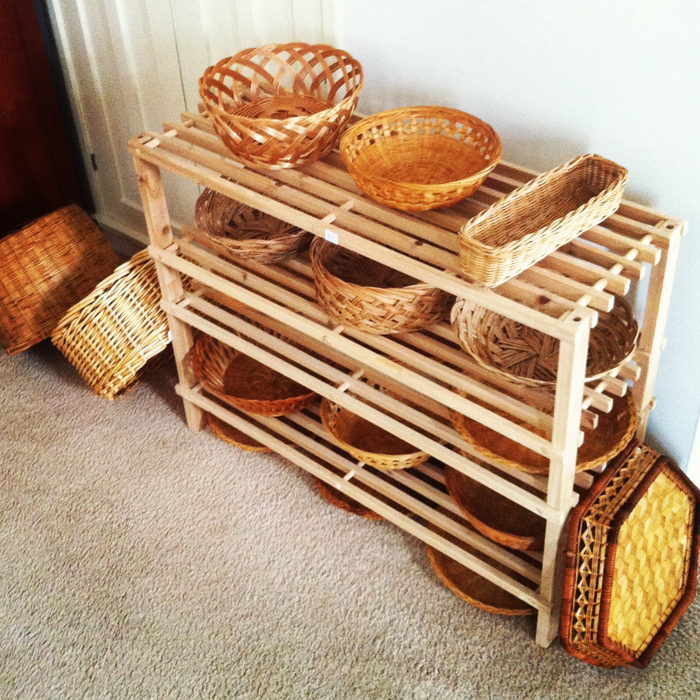 I decided that Eva needed a simpler, more open area with stations that were much more defined, so I went to the local thrift store and spent $20 on some wooden shelves and a bunch of baskets. Eva’s new station takes up less space in the kitchen, but it seems to be working out better than the other did. To start, I added a few clothespins to the wall above the station (held on by 3M contact strips so the walls aren’t damaged). 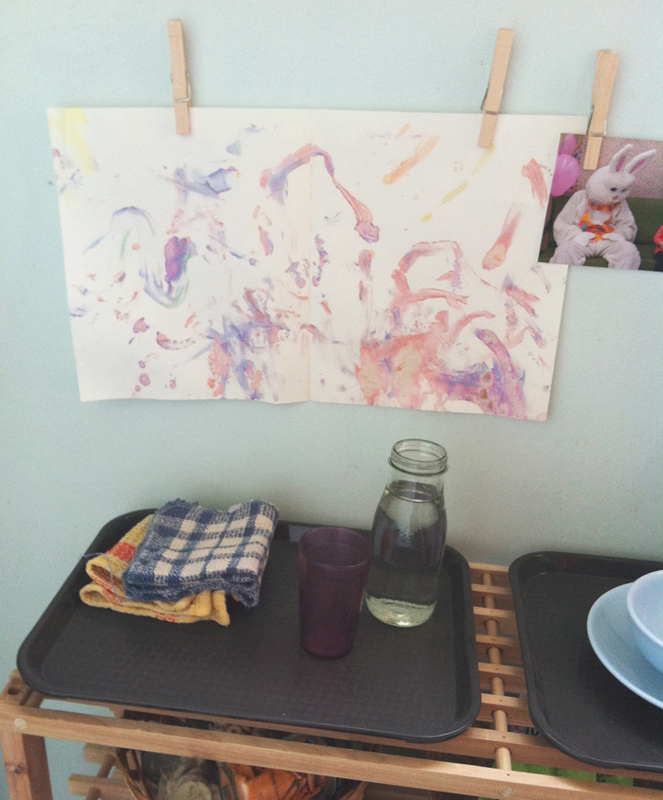 I clipped a couple of pieces of artwork and a recent photo to give Eva a place in the kitchen to display her work, since our fridge is always pretty crowded. For the top shelf, I changed the drink station up a bit. The last pitcher proved too enticing, since filling and dumping from the pitcher is the greatest thing Eva has ever discovered. It now lives a new life as a bath toy and Eva’s drink station has a plain old Starbucks bottle filled with water and a small plastic cup along with some towels for cleaning spills. The cup is one of many that we picked up at a restaurant supply store, but I only put one out at a time because it cuts back on the dumping. Note: in the photo the pitcher is filled with water, but I now only keep as much water in there as will fill in those small cups because Eva is still learning about things like “cup capacity” and “not pouring out an entire bottle at one time”. For some reason, I didn’t take a photo of the other station on top of the shelf. It has one plate, one bowl, a fork, and a spoon. We only use the space occasionally when Eva is “cooking”. The cooking tasks that she’s working on right now include cutting a banana into slices, stirring fruit into yogurt, and spreading cream cheese on bagels. She has small cheese knives that I pull out when she’s cooking, but I don’t leave them on the station because I don’t want her to run around with them when we aren’t having supervised cooking time. 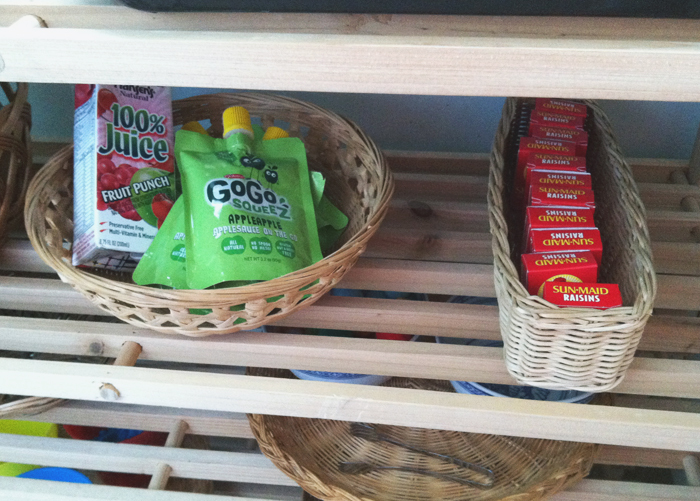 The second shelf contains baskets of snack foods. After the disaster that was open bins of cereal, I decided to package the foods individually and used old baby food jars to hold things like crackers, cookies, and dried fruit. The next basket holds applesauce in cups and pouches, as well as one box of fruit juice a day, and the last has a stash of raisin boxes. Usually, I would be worried about Eva pigging out and filling up on junk, but ever since she turned out to be in the failure-to-thrive weight range, we let her eat whatever she wants, whenever she wants. In fact, I wish I could tell you that she pigs out, but she usually eats about two jars and a pouch of applesauce a day and leaves the rest. We’re trying to keep the foods as varied as possible so she stays interested, since her boring nut-free diet is a likely culprit of her slow weight gain. If anyone has any ideas for snacks, let me know! Maintaining this food station has been a lot easier than the old one was because it’s very clear when the baskets or jars are empty. I only let her have one open at a time and she knows to put the jars on the counter when they’re empty or bring them back to me with the lid if she’s eaten as much as she wants and there’s still more in there. It would be cheaper not to have to buy boxes of raisins or pouches of applesauce, but the cost is really quite low when you think about it and it’s nice to have it so contained. I think of it as prepping Eva’s “fourthmeal” – when she goes to bed, I can just pop into the kitchen and refill jars and baskets for the next day. The only thing I really need to check throughout the day is her water bottle and usually she’ll bring it to me if she wants more water. The other two shelves hold works for Eva to do in the kitchen. The shelf in the middle is very thin because of the way the shelves are stacked (they’re actually two IKEA shoe racks stacked on top of each other). I somehow didn’t take a picture of one of the baskets, but it holds a small wooden elephant puzzle. 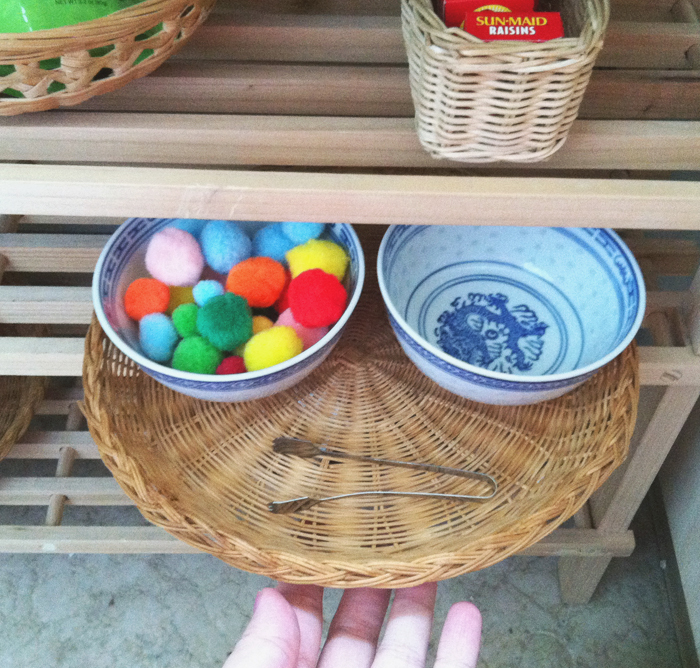 The other basket holds her beloved puff balls, this time with tweezers and two glass bowls. Eva works on using the tweezers to move the puff balls from one bowl to the other. We introduced new sizes to make it a little more challenging and, even though it sounds boring, she can do it for around an hour and never look up. 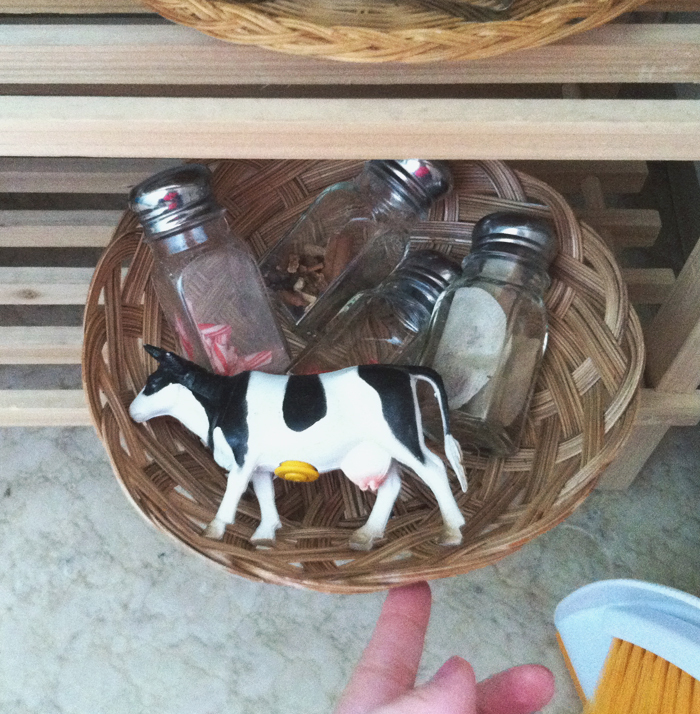 The lower shelf has what the Montessori method calls a “treasure basket”. It’s a catch-all for items that have currently caught Eva’s interest and it’s designed to be refilled every month (or week if you’re ambitious). In the photo, I have her current favorite $1 Target bin cow along with the smelling shakers, but I took the shakers out after realizing that Eva was over them so these days the basket has the cow, a squishy ball that lights up, a rubber caterpillar, and a small piece of fabric that she’s been carrying around occasionally. 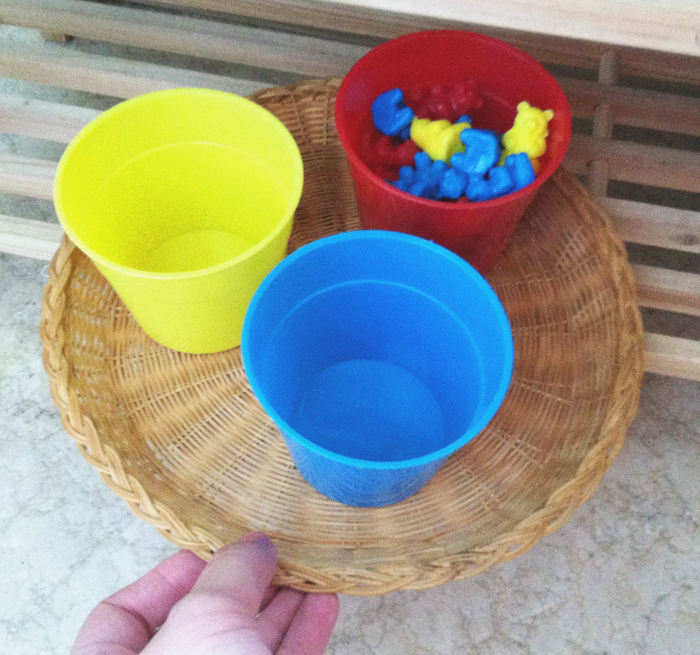 The last work is a basket tray with counting bears and cups. This is to replace the beans, because although Eva loved, loved, LOVED her dried beans, I was sick of finding them all over the house. I kept all of the utensils and beans, but they’re bagged up and they only come out when we’re sitting down to do an activity together. The bears are much more manageable and even though Eva is mostly just dumping them and picking them up, we’re working on color sorting and a little bit of counting. I know that tons of homeschool parents use counting bears for all sorts of things, but I haven’t even begun to explore that whole other world. Thanks for the detailed post! I’ve been experimenting with Montessori with my 26-month-old. It seems like ours are about the same age, so this was really interesting and helpful. Thanks for the comment! I hope it’s working out for you. We’ve had mixed success – I actually have another post about that coming up soon. Hopefully it will be easier with the second kid! I am wondering if anyone would know where to find shelves like those? I know you found yours at a thrift shop, but I have been searching everywhere online and can’t find anything as functional that isn’t at least $75. Love this post by the way! So helpful. Those shelves are IKEA shoe racks. I’m not sure if they still sell these ones exactly, but you might be able to find something similar? Hi there, came across this while searching for kitchen ideas for my three and a half year old. I love how you talk about what did and didn’t work and sharing what you changed. We had a snack basket in the pantry that was a total fail at 2. My daughter also has a nut allergy and finding easy snacks that are shelf stable is hard. Have ya’ll tried Sunbutter? I put some in a small tupperware and she is learning to spread it on a bagel. We also made our own mini muffins that I used to put in a little tin. I like keeping snack out but we have a dog. Maybe he would ignore certain snacks. Yeah, that’s a tricky one – when I was younger there were no wrappers that would stop our dogs! 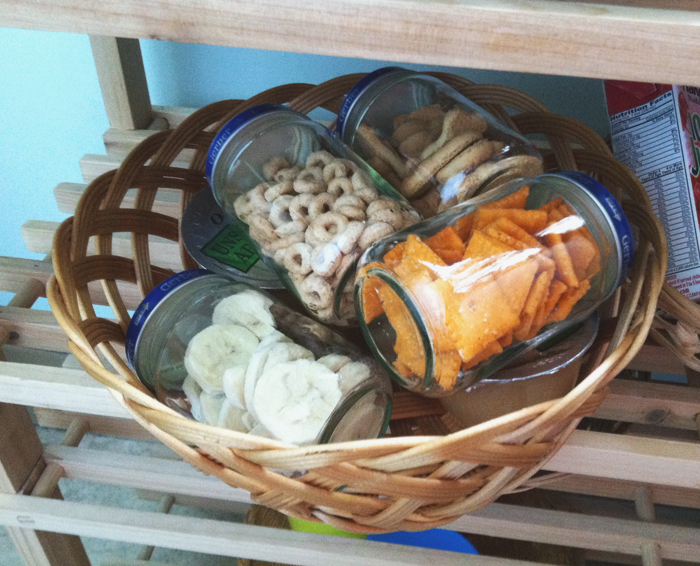 If you feel comfortable with it, maybe try heavy glass jars with lids (cookie jar style)? Hi Carly! I know this post is a little old, but I’m curious how your Montessori things are faring now that Calvin is in what I call “the destructo” stage for little boys. My daughter is 3 ½ and my son is only 21 months younger (22 months right now). A is getting to where we could do lots of games/crafts together and she could handle these things on low shelfs…but baby brother would OBLITERATE it and I would spend my whole day picking up after him. I’m just not willing. Thoughts? 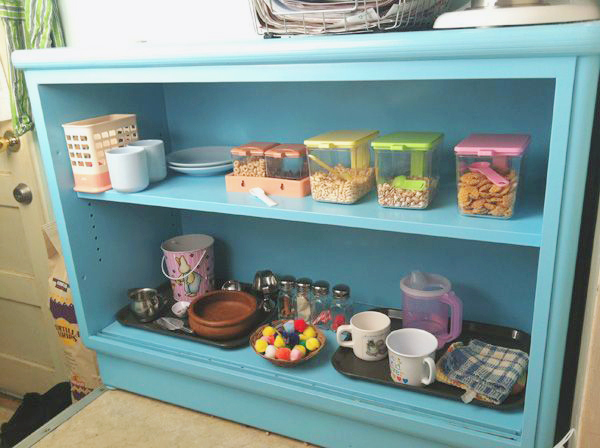 Thank you so much 🙂 Your kitchen area has been the most helpful post for me since I started researching Montessori rooms! I love the ideas and I can’t wait to try some out. Hey there. 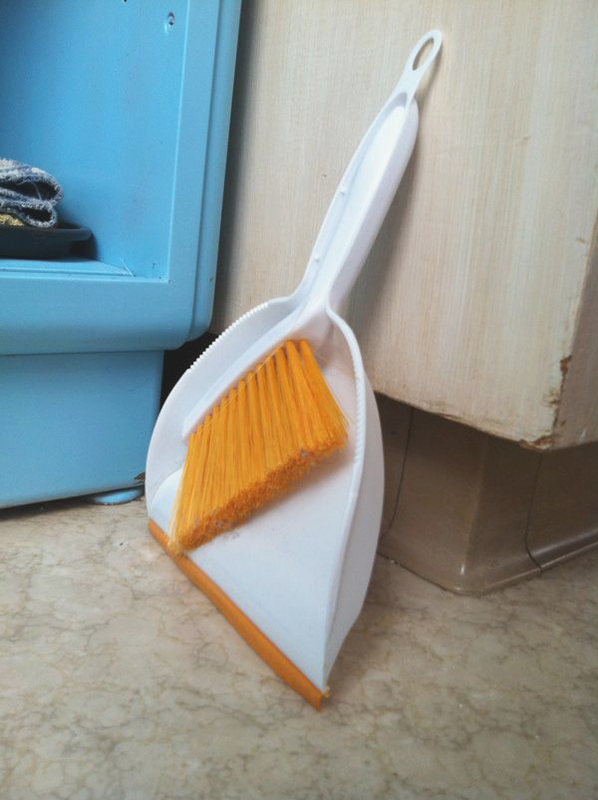 Thank you for this cleaner idea. 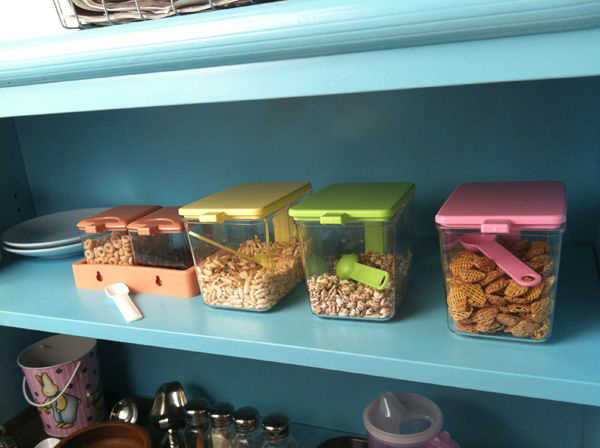 Can you tell me what is the brand of the snack containers??? I’ve looked without success yet. I’ll gladly appreciate it. Maybe try some baggies of meat jerky and a high protein milk box? Those tend to help with weight gain… it’s hard. I was also a non-eater as a child. My mom had a rough time getting me to gain weight. wow thanks for sharing your experience, showing us the process, what failed and what worked, I learned so much!